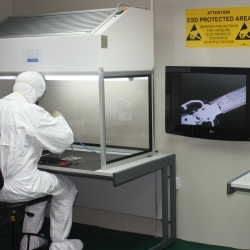 Many companies alleging to offer data recovery are in fact either resellers or simply over excited amateurs that have not invested in clean room technology; our labs can be clearly seen here in this photo it is in house you can see our logo emblazoned on the laminar flow cabinets and the engineers clean room outfit. Make sure you can see evidence of a clean room of the company you are considering sending your media to a data recovery company. Please take a look at some of the companies and organizations we have helped over the past 11 years.